Over the past few years, Facebook has become such an integral part of our lives that we can’t imagine life without it. Approximately 2.8 million Kiwis are active on Facebook, which represents a significant percentage of our population. 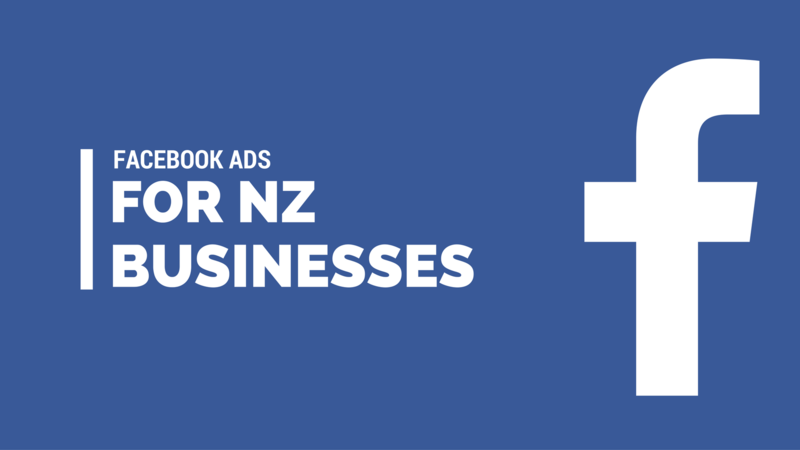 With such an overwhelming audience size, it’s not hard to see why many New Zealand businesses are choosing to advertise on Facebook. But where do you start? All you need is a Facebook Account to get started. Now we’ll explain a little more about the key steps involved! This allows you to use the location of the user to show relevant Adverts. 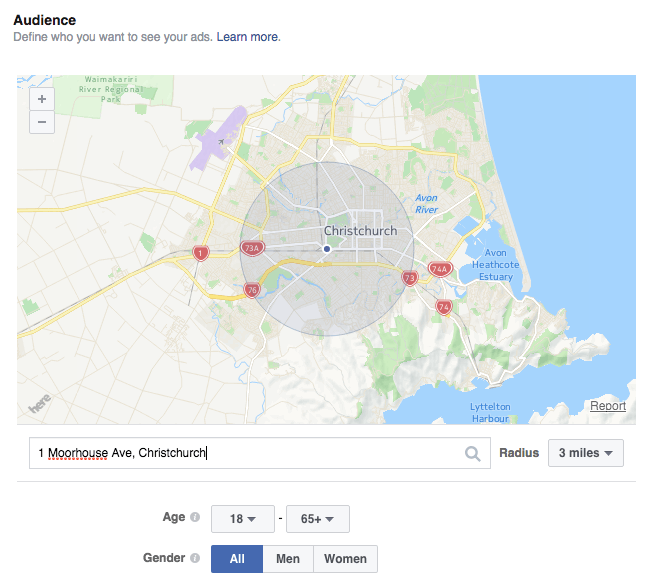 For example, if you are a local cafe in Christchurch, you can target only people who are physically within 5 miles of you. This targeting ensures your Ads aren’t being wasted on Facebook users outside of this radius who are not likely to visit your cafe. (Note: Facebook being a US company still uses miles as the standard unit of measurement. Remember that 1 mile = approx 1.6kms). Alternatively, if you run a nationwide eCommerce business, you can target all of New Zealand easily. This allows you to target customers of a certain age. For example if you are promoting a video game store in Auckland you may wish to target a younger demographic. Here you can target customers based on gender. For example if you are promoting wedding dresses it may be more appropriate to target a female audience. One of the most powerful targeting tools, this allows you to target users based on their interests and hobbies, for example ‘Pets’ or ‘Rally Driving’. You can also include language-based targeting, connection-based targeting (for example targeting users that are connected to your Facebook page) and Custom Audiences for more experienced Facebook advertisers. By using a combination of these targeting tools, you can have maximum control over who sees your Ads. Be aware that when selecting a target audience, the more targeting refinements you put in, the smaller the reachable audience will be. In New Zealand, because we have a relatively small population to start with, over-targeting can make your target audience too small to generate sufficient ROI. Make sure you keep an eye on the potential audience size! One of the most common types of Facebook Ad formats, Photo Ads include a photo and basic text. These tools are used to help convey messages to your target audience. In addition, Photo Ads are relatively fast to set up, and are ideal for Facebook Ads that are focused on a single product or service. For example, Photo Ads would be suitable for a new attraction at Wellington Zoo. Carousel Ads take Photo Ads one step further, by allowing you to showcase multiple images in a single ad that the user can scroll through easily. Each image can have a different message associated with it if desired. Carousel Ads are great for telling more of a story than a single Photo Ad. For example, you could showcase a new range of gumboots available at a local store. A further extension of Carousel Ads, Slideshow Ads combine a series of images into a video-like presentation automatically. You do not need to have any video production skills, simply select the images and messaging you want and Facebook will do the rest for you! This is perfect for small businesses that want professional-looking adverts without hefty production costs. Video Ads showcase a selected video to your target audience. Facebook Video Ads typically have stronger user engagement, so can be a powerful tool to communicate your message to customers. Canvas Ads are a relatively new Ad Format which allow you to effectively build mini-websites within the Facebook browser. Canvas Ads can include images, video, text and Calls-To-Action (CTA’s). The Canvas Ad Format type can be difficult, so this is recommended for experienced Facebook Advertisers only. Feeling confident now? The best way to get started is to open a Facebook Account and trial campaigns with small amounts of money. Your business results will always be unique, so it’s often a matter of testing and learning until you find the right formula for your business. If you need a hand, contact our social media experts and we’ll help you construct high-quality Facebook Ad campaigns, right here in New Zealand.